North Korea introduces a new “ultra-precision” Scud variant. What good is it? KCNA’s statement on the test added that this new Scud, which uses liquid fuel like all others in use by North Korea, has a shorter “preparatory process before launching.” This reportedly “markedly [reduces] the launching time.” This has been a theme with North Korea’s missile testing this year — especially with the solid-fuel Pukkuksong-2 medium-range ballistic missile. Pyongyang is looking to fire missiles with less warning and lead-up time, smaller satellite signatures to avoid preemptive detection, and from anywhere in the country (hence the tracked transporter-erector-launchers for this missile and the Pukkuksong-2). The KCNA announcement about the test is also notable for what it omits, which is any mention of this system serving as a potential test-bed for a ‘carrier-killer’ anti-ship ballistic missile, contrary to what U.S. officials have speculated in press reports. As I suggested in April, the fact that North Korea was looking into terminal maneuverability for its missiles was not highly suggestive of an anti-ship ballistic missile program, which is challenging primarily due to the advanced intelligence, surveillance, and reconnaissance (ISR) capabilities it would require. North Korea almost certainly lacks these capabilities to reliably operate an ABSM based off this Scud in wartime, but that’s not to say that Pyongyang may not look to eventually introduce a Korean People’s Navy-variant of this system, presumably to send a deterrent signal to the United States Navy. So, given that North Korea has had well-tested and mostly reliable short-range Scuds for a while, what good is a new “ultra-precision” variant? First, there’s the obvious knowhow factor here. North Korea has successfully flight-tested a more precious single-stage liquid-fueled missile, which may lead to it eventually taking what its learned about control surfaces with this Scud and applying it to the Nodong or future missiles. 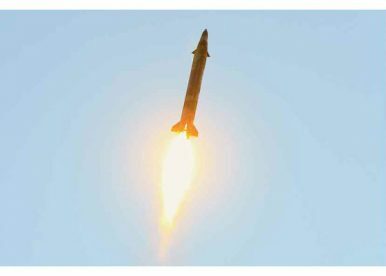 KCNA’s statement following the Pukkuksong-2’s first test in February, for instance, mentioned that “the feature of evading interception” had been tested, even though no control surfaces are visible on the warhead of that missile. Second, if North Korea’s nuclear strategy, as it appears, will hinge around first strikes against U.S., South Korea, and Japanese military targets, precision strike capabilities with even conventional warheads can be immensely valuable. If the U.S. and its allies believe that Pyongyang can reliably hit command and control nodes, for instance, they may be incentivized to harden these targets against attack in the short-run. Third, if North Korea wants to defeat advanced theater missile defense systems in use by the U.S. and its allies, ranging from Patriot Advanced Capability-3 systems in Japan and the new Terminal High Altitude Area Defense (THAAD) system in South Korea, terminal maneuverability is one place to look for a solution that is slightly more elegant than a more crude ‘saturation’ strike, wherein Pyongyang would seek to overwhelm the missile defense system’s battle management software with a barrage of ballistic missiles. Just one of these new Scuds might not present a challenge for THAAD, but Pyongyang would likely aim to use a mix of saturation and evasion in wartime to beat out existing missile defense solutions in the region. With the introduction of this new Scud, North Korea has introduced and successfully flight-tested three new types of ballistic missiles since February this year, when it first showed off the Pukkuksong-2 solid-fuel, medium-range ballistic missile. Kim Jong-un declared the Pukkuksong-2 to have reached initial operating capability earlier in May, just three months after its first flight test. Earlier this month, it flight-tested the Hwasong-12 intermediate-range ballistic missile successfully as well. Not only has North Korea kept up the pace of missile testing it showed in 2016, it is quickly introducing a new suite of missiles to enable its emerging nuclear strategy. Over the past 17 months, since its fourth nuclear test, North Korea’s relentless testing shows that it is inexorably expanding its knowledge base, diversifying its ballistic missile forces, and steadily heading toward deadlier and more precise missiles that it fully intends to use in wartime. In May 2017 alone, it has conducted ballistic missile tests at the rate of one every week (even throwing in a surface-to-air missile test this weekend). Pyongyang’s pace of testing shows no signs of slowing down. US Missile Defense Agency Head: North Korea's ICBM Ambitions a Source of 'Great Concern'Exclusive: North Korea Tested Its New Intermediate-Range Ballistic Missile 3 Times in April 2017It Wasn't an ICBM, But North Korea's First Missile Test of 2017 Is a Big DealUS Intelligence: North Korea Is Continuing to Produce ICBMsWhat Does Trump Mean When Alluding to a North Korean 'Missile Test' Freeze?